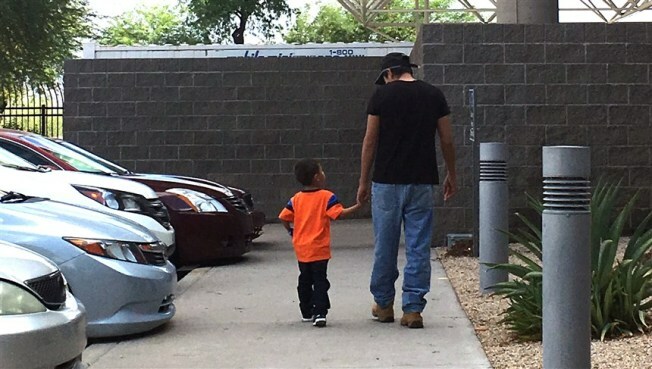 Jose and his 3-year-old son, Jose Jr., were separated after entering the country and seeking asylum in mid-May. They were reunited on July 10 in Phoenix. For six days after being detained and separated from their mother at the border, Franklin, an 11-year-old Honduran boy, and his 7-year-old brother Byron slept very little and were constantly cold as they huddled under foil-sheet blankets, NBC News reported. "They would wake us up at 3 in the morning and we were so tired," he said, adding that he didn't know why they would wake all the children up. The ham they gave the children was cold and raw, said Franklin, whose mother Maria Gloria asked that their last name not be used out of concern for her family's privacy. said the worst parts of the ordeal were the icy temperatures and not knowing when they'd ever see their mother again. Franklin and Byron were among the thousands of children separated from their parents under President Donald Trump's immigration policies. As the court-ordered deadline for reunifying those families passed Thursday, interviews and court filings have revealed a series of migrant adolescents and teens alleging a range of mistreatment from inedible food, brutally cold temperatures with no blankets for all the children, not being informed of their rights, bullying, guards who kick their feet to wake them up and verbal abuse. They also show the emotional toll of family separations. The two were separated from their mother on June 2 after crossing the border on May 31. They were seeking asylum after the family faced repeated death threats in Honduras. Franklin and his brother were eventually sent to live with a foster family in New York, but were not reunited with their mother until July 13.